A Marvelous Collision: "Archie Meets the Punisher"
Growing up, I remember an episode of Full House that crossed over with Family Matters. At the age of 8, my mind was blown at seeing Urkel interact with the Tanner family, dancing with Uncle Jesse. Seeing a character displaced into an unfamiliar setting was fascinating. At the time, I thought it would certainly be the most unexpected and delightful crossover I would ever experience. Then, I stumbled into the world of comics where the unthinkable often happened, for better or for worse. Comics where characters published by one company meet those published by another company have always had a special appeal. In the first major inter-company superhero crossover DC’s Superman met Marvel’s Spider-Man. Since that landmark 1976 event, from time to time, comic readers have witnessed unbelievable meetings on the printed page. The X-Men met Kirk and Spock. The Savage Dragon fought crime with the Teenage Mutant Ninja Turtles. Batman brawled with a Predator. Seeing characters in unfamiliar settings, interacting with other characters they should never meet, remains a captivating storytelling device today. It’s fitting that the best crossover in the history of the comic medium is also the most absurd. In 1994, two contrasting universes merged for a single, unforgettable experience when the Punisher occupied Riverdale in a 48-page, ad-free issue. 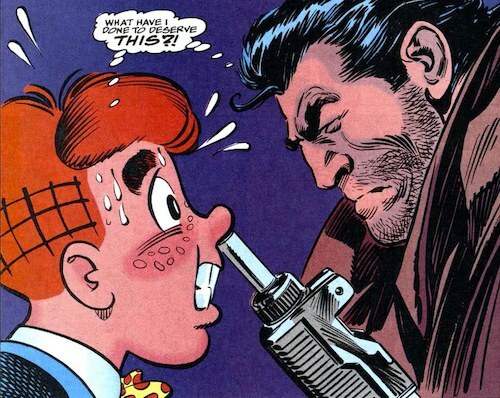 Archie Meets The Punisher is surely the strangest crossover event in all of media, yet it excels in every aspect. It’d be fun to speculate about who in the world the target audience is for the book, but the appeal is admittedly infinite. Utmost in its outlandishness, what could have been a bad Saturday Night Live sketch, turned out to be an remarkable Punisher story and a fitting Archie story. Written by Batton Lash, everything in the issue makes sense. Somehow. As the introductions to the book state, the idea started as a total joke. During the age of what’s now called the speculator’s market, Archie’s vice president Victor Gorelick rightfully thought the idea of putting the two icons together would sell a lot of books. The shock value alone of seeing the Punisher on the cover, gun in-hand, chaperoning the Riverdale High Sock Hop would undoubtedly be worth the purchase price and would rightfully, in turn, send sales through the roof. With the cover presented as a “#1” and proclaiming itself as “the team-up you thought would never happen,” at a glance it’d be easy to write the book off as a forgettable novelty made entirely for the collectables market. Yet, since the company turned to Lash for the story, they ended up with an enjoyable tale worth reading and re-reading. As if putting the team-up together didn’t defy the odds enough, instead of book having a single dominant art style more suitable for one character’s universe than the other, which is typical for crossover tales, this book champions both patented looks. 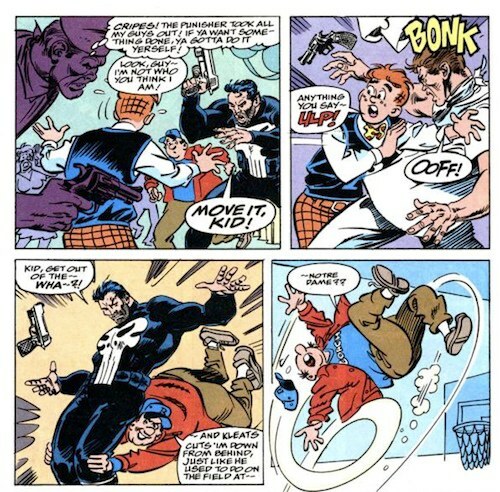 The Archie images were drawn by the remarkable Stan Goldberg and the Punisher elements were drawn by the celebrated John Buscema. Even when the characters interact within the same panel, it’s a superb, prestigious party of contrasting illustrations. The juxtaposed graphics only enhance the clashing sensibilities and themes in the storyline. The issue opens with Frank Castle, the Punisher, chasing his latest target, "Red" Fever, who despite a sinister smile bears a striking resemblance to America’s favorite teenager. The first few pages visually mirror any Punisher book you’ve ever read including plenty of gunfire and an eerie shot of the nightmarish Archie lookalike making his getaway. He manages to evade Frank, hopping a train to Riverdale and posing as a business partner of Hiram Lodge. To make things worse, when he’s not confused for Archie anymore, “Red” manages to accompany the lovely Veronica to Riverdale High's Sock Hop. His arrival shifts the art style to the simpler, retro pop art of Goldberg’s typically cheery Riverdale. The Punisher and his fixer Micro storm into Riverdale, believing that such a squeaky-clean town must be hiding its own special breed of hell. There’s a wonderful sequence early on in Frank’s visit to Riverdale where we see Archie’s suburbs through the Punisher’s eyes and Buscema’s stunning pencils. Soon Frank Castle sees Riverdale as what could have been; he glimpses the charmed life he could have led if his family hadn’t been gunned down and taken away from him. It’s moving in a way you wouldn’t expect this book to be. However, as you would guess, Frank mistakes Archie Andrews for his quarry, and trails him with abandon. Hilarity and dramatic tension ensue. Everything does get straightened out but not without plenty of hijinks. Miss Grundy becomes smitten with Frank and a mistaken Moose Mason clobbers him. When all is said and done, Archie gets his chance to rescue Veronica while the Punisher dishes out retribution. All in all, both worlds are played unapologetically straight up with neither Archie nor the Punisher veering from their traditional portrayals. Obviously, the Punisher doesn’t belong in Riverdale, and the conflicting dialogue, art style, and tone affably reinforce that. Sure, Frank’s a little sanitized on this mission; blood and guts wouldn’t work well here but that’s about the only complaint you’d get from Punisher fanatics. The lead characters stretch each other’s worldview, but they never really break character. Frank Castle is gritty and brooding. Archie is innocent and a bit goofy. As an added bonus, the medium reflexivity that takes place is wonderful. There are all sorts of in-jokes for fans of either series. Case in point: Betty’s Diary, Punisher’s War Journal, and the first entry in Archie’s War Journal all, oddly enough, figure into the narration. The entire Archie universe has a cameo or gets a mention, even Sonic the Hedgehog. Josie and the Pussycats show up as the band at the dance. Marvel's Millie the Model and Archie's Katy Keene exchange fashion advice. In the same panel, Archie’s Sabrina the Teenage Witch hints at meeting Marvel’s mysterious Doctor Strange by saying, “So I asked the Doctor if the Hosts of Hoggoth were really hoary.” The Shield, a Golden-Age, Archie-owned patriotic superhero (that predates Marvel’s Captain America) makes a cameo of sorts as a decoration vital to the action-packed climax. The fact that a Jughead/Wolverine crossover is jokingly hinted at in the last two panels is just like the cherry on top of one of Archie’s milkshakes at Pop’s. From the Punisher’s driven, hardened demeanor to Archie’s loveable, clumsy reactions, everything is handed with absolute respect and just enough levity. What started as a joke, and as profit-minded business venture turned out to be one of the most memorable comics you’ll come across, crossover or otherwise. If you can find a copy, don’t miss the Punisher’s trip to Riverdale. This gem is an off the wall, once-in-a-lifetime opportunity that, for readers, is the exact opposite of punishment.